Art Advocado: Art Education Advocacy Blog: Artists and Jocks - Unlikely Allies? 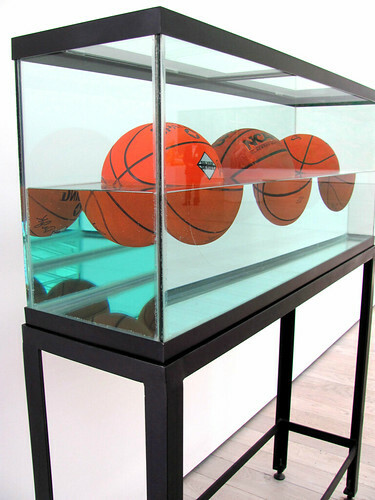 Jeff Koons, Three Ball 50/50 Tank, 1985. Broad Art Foundation, LACMA. Image courtesy of rocor on Flickr. Recent efforts by the Institute of Museum and Library Services (the federal agency that supports, wait for it, museums and libraries), in conjunction with several professional associations, are working to combine these two seemingly opposite ends of the spectrum. Let’s Move! Museums and Gardens, which launched on May 23, is a collaborative program that will engage museum and garden visitors in exhibitions and activities promoting physical activity and healthy living. Over two thousand participating institutions hope to reach 200 million visitors with the program in the next year through interactive exhibitions and after school/summer programs, as well as healthier food choices within the institutions themselves. “Let’s Move! Museums & Gardens is a terrific example of the role that museums can play in addressing societal challenges and devising strategies to shape a better tomorrow," Ford Bell, the director of the American Association of Museums, said on the occasion of the program’s launch. Indeed, this connection between cultural and physical well-being is an interesting one. Though some of us (at least the, er, less athletically inclined ones) on the artistic side may think of athletics as mainstream and thriving, the numbers paint a different picture. Aside from abysmal statistics on the health of kids in our nation (nearly one in three kids qualifies as obese according to the Let's Move! press release), phys ed budgets have been targeted for cuts alongside art education ones—making the two areas potential allies in their struggles. As Valerie Strauss pointed out in the Washington Post, art ed and phys ed are both in the unenviable positions of having to provide statistics to proving the benefits of their respective subjects—when they are really quite obvious to anyone paying attention. Though details about the nature of Lets Move! programming have yet to emerge, I wonder if similar programs could possibly emerge in school systems to make the most of declining budgets in both subjects. Tongue-in-cheek kidding aside, artists and jocks might have more in common than we previously thought!